The first column in the Bird Shots series for Bird Watch SXM in The Daily Herald’s Weekender focuses on getting close to birds. As you can see in this photo, nature often provides an impromptu bird blind at the right moment. In this case, it was a group of trees. Partially hidden, it was possible to get pretty close to this juvenile Yellow-crowned Night Heron. In this situation, one has the option to shoot through the vegetation, use the vegetation to get close before stepping out for a clear shot, or doing both. I would recommend at least trying a few shots while partially obstructed by vegetation. Practically-speaking, stepping out to get the clear shot may scare the bird off before you get any clear shots. Shooting through vegetation can also be used to create interesting compositions, and to showcase important aspects of a bird’s habitat. Both these topics will be covered in later articles. For now, it’s enough to mention that the partially-obstructed views you have when sneaking up on birds can sometimes be used to capture photos that are more interesting than the average bird portrait. 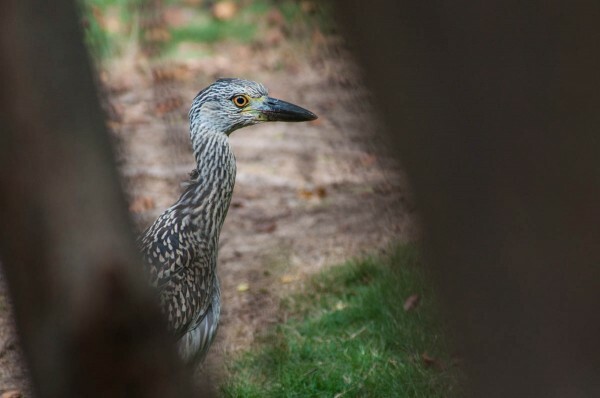 A juvenile Yellow-crowned Night Heron, seen through trees.